I sometimes wonder how nice it must be to own a business that has no competition - it is a recipe for success? Take Clementine's café and bistro in the tiny seaside village of West Runton, on the North Norfolk coast. Now West Runton is hardly over-run with tea shops or, indeed, catering establishments of any sort. So if you want a cup of tea and a slice of cake, or something more substantial, and you're halfway between Cromer and Sheringham then you go to Clementines by default. There aren't really many viable alternatives. So all the owners have to do is turn up and put the kettle on, right? Guaranteed success? Well, maybe, but more likely not. Even without competition, if a tea shop is no good it will fail, simple as that - consumers are too discerning and too fickle to tolerate mediocrity. Lucky for us all then that Clementines is excellent, and successful on merit. Since we're here to talk about great tea, let's start with that: the loose leaf basics are all well catered for (English breakfast, Assam, Darjeeling, Lapsang Souchong, Ceylon and Earl Grey), and these are supplemented by a wide range of bagged teas from Clipper (green tea, organic decaf, peppermint, camomile, lemon & ginger, wild berry and a "comforting infusion"), plus Tick Tock decaf. So much to choose from! Plus Fair Trade coffee and hot chocolate. You're spoiled for choice, basically. 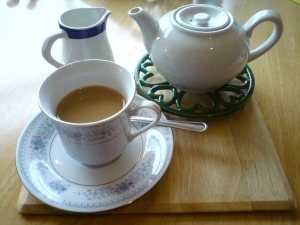 Oh, and the teapot comes served on a little metal stand; I know it's probably to save their tables and/or tablecloths, but it's a nice touch and something the purist in me very much approves of. Accompanying food is good too, from the obligatory cake (including gluten-free and dairy-free options) to more substantial meals - Clementines has a particularly good breakfast menu, and I can personally vouch for both their full English and eggs Benedict. The vegetarian cooked breakfast also looked terrific. And of course, being a seaside town there's a fish and chip supper on a Friday evening. What more could you wish for? To summarise then, Clementines does everything right and nothing wrong. Should you find yourself half-way between Cromer and Sheringham and in need of a brew, you're fortunate - there may only be Hobson's choice, but it's also the right choice.